CVA 1399-494 – [Photograph of Acme Novelty B.C. Ltd building, 7832 6th St., Burnaby B.C. 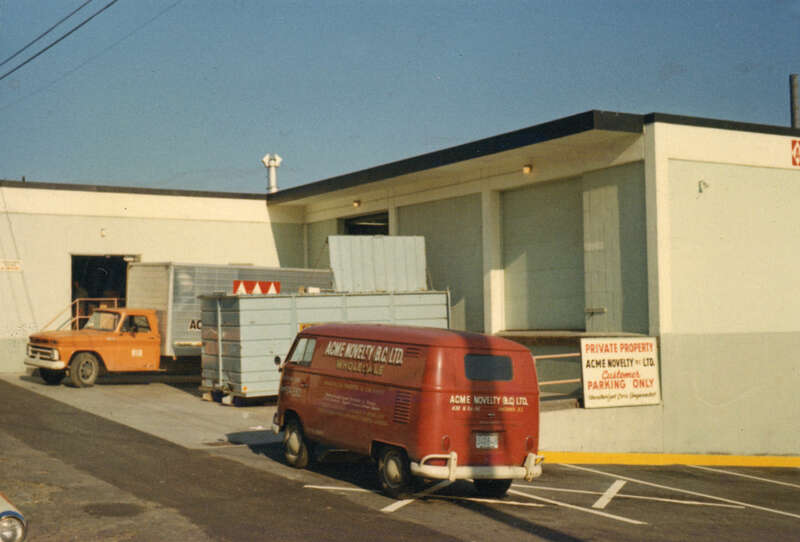 (VAIW Note: See photo and comment below: This was not located in Burnaby, as CVA asserts, but in Vancouver at – see the printed address on the rear of the ANC van below – 428 West 8th Ave). 197-? This image appears to have been made sometime in the 1970s; right around the same period when the hapless Wile E. Coyote was entertaining fantasies of terrorizing the nameless Roadrunner using machines built from products made by Acme. The company portrayed in the image, however, could not have been the same “Acme”; this one included “Novelty” in its corporate name – a word which would rarely be associated with the products produced by the fictional company portrayed in the Warner Brothers cartoon – and never with the cartoon’s plot. CVA 1399-495 – [Photograph of Acme Novelty B.C. Ltd building] at 428 W 8th Ave., Vancouver. 197-? This entry was posted in advertising, automobiles, street scenes, theatre/vaudeville/cinemas and tagged acme novelty, bc, burnaby, history, looney tunes, Roadrunnner, vancouver, warner brothers, Wile E. Coyote. Bookmark the permalink. 5 Responses to Where W.E.C. Shopped? This picture was taken at Yukon & 6th Ave in Vancouver, not Burnaby. That is the Fairmont medical building on Broadway in the background with the Canadian flag atop it. I think you’re correct. Thanks for catching that. I won’t make the correction to this post until I’ve confirmed that Yukon and 6th was the location of Acme Novelty in the 1970s. (Unfortunately, I’ve had very little success in passing along corrections to CVA, so I’ve stopped alerting them to their errors). Thanks again. Thanks for you patience regarding this. 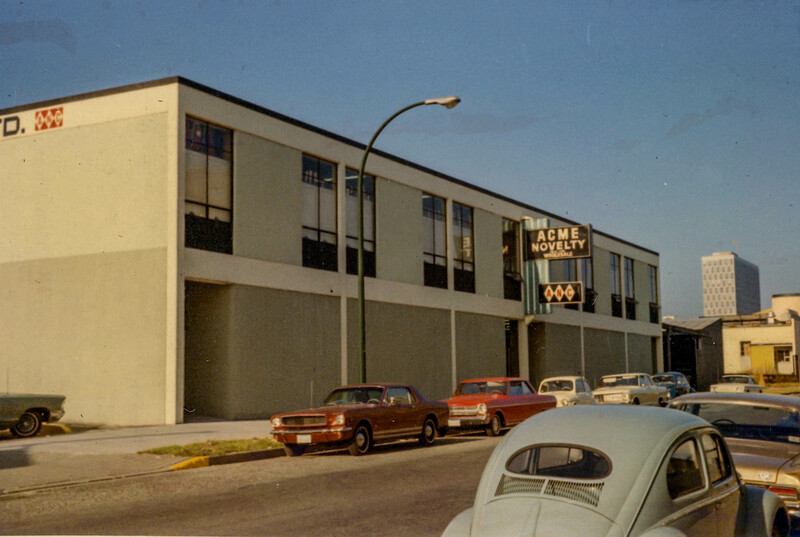 I recently had a look in Greater Vancouver Directories for various years in the 1970s along Yukon, but wasn’t able to confirm that Acme Novelty was there. I was in a rush on the occasion when I was in the library, however, and may have missed something. I will check again in the future. But I agree with you that the building in the background of the image is the Fairmont. I’ve updated the post as of today with a note in the caption that shows both the CVA’s address for the image and yours (with a note that I think yours is more likely). Thanks again for taking the time to comment. One last comment on this. A buddy of mine found another Acme photo at CVA’s site. On the rear of the van in that photo appears Acme’s address. You were right! it was just off Yukon on 8th Ave.! I STILL HAVE A ACME NOVELTY CATALOG ! WANNA SEE IT ?